While ranch work consumes the guys, as usual, and I march off to my day job at the library, bits and pieces of blessings flow around us. First, remember these, my Red Dirt shirts I made to benefit the Washakie County Library Endowment? They were sold at a silent auction fundraiser. The characters of Henry Standing Bear and Walt Longmire are the creation of Craig Johnson and his extraordinary Wyoming-based Longmire book series. Mr. Johnson was speaking at that little fundraiser and his usual repertoire of lively stories could now include the television show “Longmire”, the new hit series on A&E based on his books. The characters have become real, and Lou Diamond Phillips and Robert Taylor are masterful in their portrayal. Mr. Johnson now finds himself a “creative consultant” for the show… evidently, Life In Wyoming is such an unknown concept for Hollywood! 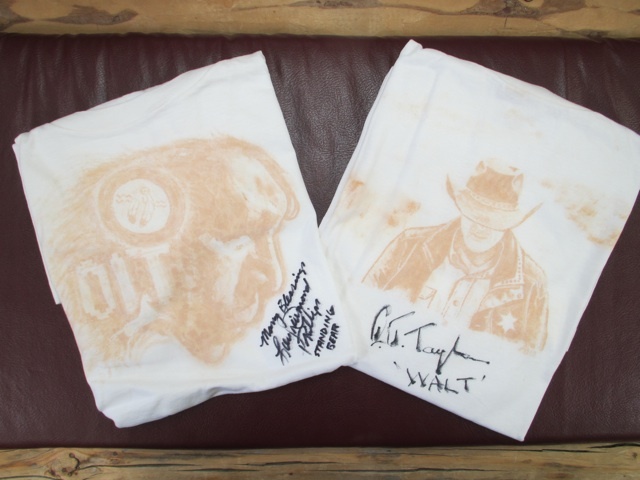 As he saw my efforts on the “baskets” which included these dirt painted t shirts, Mr. Johnson retweeted my link to Lou Diamond Phillips, who graciously offered his autograph. 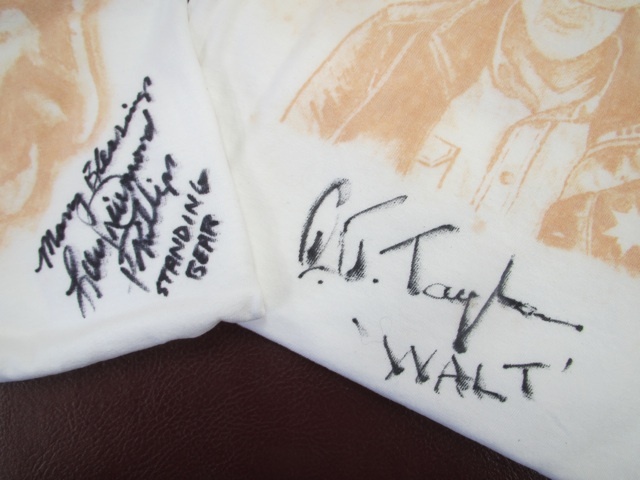 Although Mr. Taylor doesn’t tweet, I was assured he would autograph “his” shirt as well. Mr. Johnson took the t shirts and handled the mailing back and forth. 1. Mr. Johnson did not have to retweet to LDP. 2. Lou Diamond Philips did not have to offer his autograph. 3. Mr. Taylor did not have to sign his shirt. 4. Mr. Johnson did not have to take the shirts, mail them to faraway places and then back to the bustling metropolis of Ten Sleep! This effort was indeed one of “many blessings” that these gentlemen gave to Ten Sleep. All funds for the Library Endowment are matched three to one by the state, so for each $100 dollars we raise, we end up with $400. These guys and their unselfishness made that happen! Cheers to the three of you (and whoever handles your mail!)!!!!! May your blessings flow back to you a hundredfold! The other blessing that has been here the past few days… I’ll share tomorrow! Oh, yes, inserting the 16’6″ Ford Ranger into a 16′ horse trailer? Roll down windows. Put in neutral. With help, shove the Ranger into the horse trailer. Go around to the escape door, open, climb on hood and roof and into open window. Shift into gear and put on parking brake. Remove trailer gate and strap down on Ranger bed. Strap down Ranger. Drive over gravel roads, switchbacks, rocks and ruts until reaching home. Open escape door, climb on hood and roof and into open window, shift into neutral and release parking brake. Hook chain from Ranger to Tractor. Pull. Ranger delivered Redneck Style! Don’t forget to reattach the trailer gate for hauling horses next week! No dogs were involved in this little escapade. They would have measured the length of the pickup as well as the width! September 6, 2008 No entry.